IMF Managing Director Christine Lagarde speaks at the International Monetary and Financial Committee (IMFC) meeting during the 2015 IMF/World Bank Annual Meetings in Lima, Peru, Oct. 9, 2015. The world's top finance officials lavished praise on Peru's "economic miracle'' this week, lauding it for cutting poverty by half during a decade-long bonanza of record-high prices for gold, copper and other metals it mines. In a gleaming $160 million convention center built for the meeting of the World Bank and International Monetary Fund, policymakers called Peru a prize pupil of their prescriptions for financial stability. World Bank President Jim Yong Kim deemed it a "growth star.'' 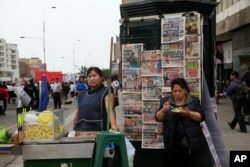 IMF chief Christine Lagarde likened Peru's economic growth recipe to its world-famous cuisine. Unfortunately, the praise may have come too late. Plunging prices for minerals, Peru's economic backbone, have cut annual growth to less than half the 6.3 percent that made it the envy of Latin America from 2002-2012, a period when per capita income doubled to more than $6,600. Several mammoth mining projects have been stalled by violent protests and declining mining revenues threaten to force cuts in the social spending. That means many of the Peruvians lifted out of extreme poverty are at risk of falling back. "The reality is that The World Bank and International Monetary Fund fiesta is happening when everyone says the party's over,'' said Jose de Echave, an economist and former deputy environment minister. He said the country squandered a golden opportunity during the boom to diversify an economy long dependent on mining for most of its export earnings. Twenty-three percent of Peruvians are poor by IMF definition. Many of the 40 percent in the next bracket - the "emerging middle class'' earning $4 to $10 a day - are now at risk of joining them. Enrique Felix, a 50-year-old security guard where the meetings are being held, is one of them. He earns about $340 a month and his soiled shirt and rusted eyeglass frames attest to it. Felix's wife was 37 when kidney disease took her two years ago. Across all of Latin America, the anti-poverty charity Oxfam says 200 million people, or one-third of the population, live in similar conditions. A street vendor waits for clients on the sidelines of a protest against the IMF World Bank, which are holding their annual meetings in Lima, Peru, Oct. 9, 2015. More than 60 percent of Peruvians workers are in the informal economy, according to U.N. figures, spending on health care and education are below regional averages and most government revenues come not from income tax but rather taxes on sales and consumption. That puts the burden disproportionately on the poor in the region with the world's most unequal wealth distribution. Latin America's richest 10 percent hold 71 percent of its wealth, Oxfam says in a new report. In Peru, 515 multimillionaires have riches equal to 32 percent of gross domestic product, it says. Finance Minister Alonso Segura said in an interview that Peru is in good shape to weather the biggest flight of capital from emerging markets in a quarter century. It has reserves of more than $60 billion, or about 30 percent of gross domestic product. With 2.4 percent growth forecast this year, the Peruvian economy will still easily outperform Latin America, whose overall output the IMF expects to shrink by 0.3 percent. The country also gets something of a boost from cocaine, of which it is the world's top producer, although Segura declined to estimate how much. What Peru lacks is both strong innovation and public institutions. The World Economic Forum ranks Peru in the bottom fifth globally in both. And so it remains heavily dependent on wooing mining investment with incentives including comparatively lax regulation. In June 2014, Peru enacted a law further easing environmental rules. Carlos Monge, Latin America director for the New York-based nonprofit Natural Resource Governance Institute, blames that law for triggering a protest last month in which four people were killed by police bullets at a $7.4 billion Chinese-owned copper mining project. Protest leaders complained that Las Bambas' mine owner, China Minmetals Corp., altered the project's plans without local consent, eliminating plans for a mineral pipeline. Instead, instead crushed ore was to be trucked through communities, increasing contamination. In May, five people were killed as farmers in a rice-growing valley mobilized against another copper-mining project, this one Mexican-owned. In both disputes, the government declared states of emergency and suspended civil liberties locally.